Rather than try random exploration of the much larger WMPVN rule space, Smith chose to focus the next phase of his cellular automata project on a comfort zone within the WMPVN space which could be shown analytically to potentially support some of the base level emergent phenomena which appeared to be particularly important to the ultimate emergence of the diversity of higher level phenomena that emerge in LOTE. Smith's primary method of study is to identify rules which support relatively slow total pattern growth from the tiny fraction of simple seed patterns that prove viable in such rules and then to run those patterns for of order 100,000 iterations. Discussion of the more recognisable emergent phenomena unavoidably invokes terminology which he has added over the years to the basic cellular automata vocabulary that has been recorded in Stephen Silver's Life Lexicon. A specialised glossary for LOTE is in preparation, although many of the sometimes self-explanatory images and animations it will use are online already. WMPVN-45678c_459abc_12 forms a small seed pattern which replicates itself in 163 iterations rotated 90° 46 cells apart diagonally, cumulatively emulating Ed Fredkin's XOR-based replicator, at least on the sometimes permeable diamond-shaped skin which forms around what would otherwise be a slower-growing growing core. (As shown in the background to this page) WMPVN-45678x_459_17 forms an active shoulder which stretches the 4 in 6 sloping leading edge of a pattern 4 cells wider every 152 iterations behind whatever puffer engine initiated the original growth. "Braids" with a 3 cell wide chequerboard core and "gutters" form trailing the leading edge, some eroding away but others lengthening to leave a pattern of mostly active gaps which eventually stabilise distinctively for the two variant rules (survive c or not). The growth shoulder sometimes regenerates after disturbance while a range of constrained environments form inside the ever-growing overall pattern. 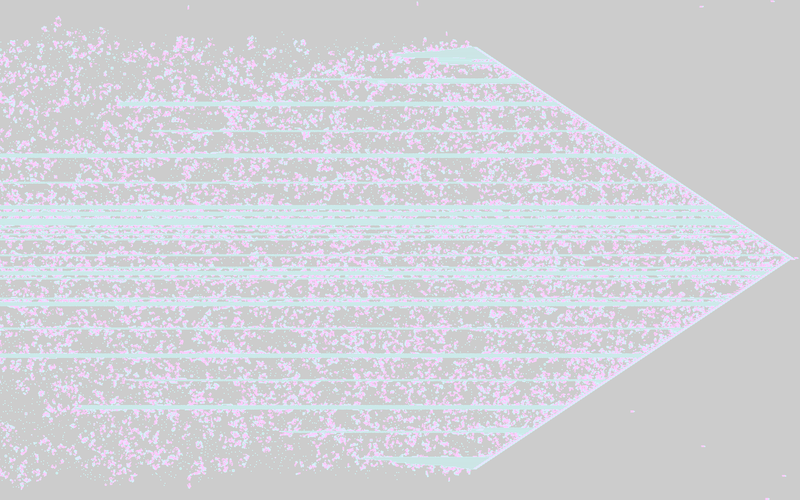 While all rules in the comfort zone produce common (space)ships which advance 1 cell per 2 iterations and form widening outbound streams from the growing core of each viable pattern, in the WMPVN-45678bx_459xxx_16+ quarter of the WMPVN zone a ubiquitous "flutterby" moves 13 cells diagonally every 58 iterations creating a ship stream background in the shape of an 8 point compass. When a "delta" (widening puffer trail with lateral rakes) forms under such rules, repeated interactions between rake ships and forward and backward flutterby rakes form large scale patterns. Amongst the unending emergence of novel mechanisms, cellular automata traditions make the WMPVN-45678_45xbx_7+ knight ship and WMPVN-45678bx_459axx_11+ knight trail noteworthy.